Don’t let anyone else tell you how much you should to borrow for college, because they aren’t the ones who will have to pay your bills. How much you should borrow is something you have to figure out for yourself. And the first step in figuring that out is constructing a college budget based around two things: what you can afford without borrowing and what it costs to attend the schools you’ve been accepted to. Let’s start with what you can afford, and let’s say you’re a soon-to-be freshman planning for your first year’s expenses. – How much money are your parents putting toward your college expenses? – How much money are you putting toward your college expenses from your savings? – How much money will you earn from a job, after taxes, while you’re in college? – How much money have you received in scholarships, grants and contributions from other relatives? – How much federal student aid have you qualified to borrow? – How much private student loan money have you qualified to borrow? Does Paying More Pay Off? Let’s say that you do need to borrow to attend four of the five schools you’ve been accepted to. The affordable option is your state school where you’d pay in-state tuition. How do you know if it’s worth borrowing – and how much it’s worth borrowing – to attend any of the other four schools? This is one of the biggest questions students face. But did you know that it’s not attending a top-tier school but simply being the type of student who can get accepted to such a school that might be the real driving factor behind those graduates’ success? Don’t assume that you need to shell out for an Ivy-league education to have a great career. Websites such as Salary.com can help you estimate what you might earn after graduation in the career and location of your choice. You can adjust any position you find for your degree level, years of experience, job performance and other factors. 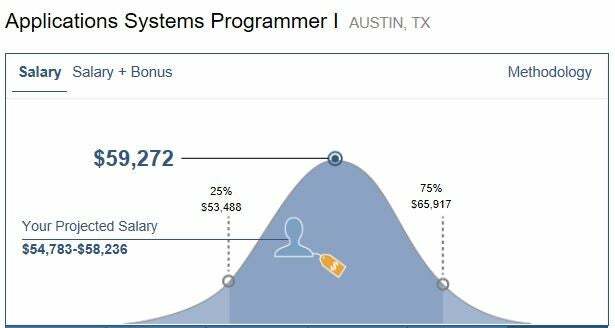 The graph below shows what a programmer in Austin with a bachelor’s degree, less than one year of experience, no underlings and average performance might expect to earn. Besides your education and prior work experience, factors that will affect your actual income include the company you work for, the economy, how well you interview and negotiate, and how in-demand your job is and your location. Even the best numbers you find online will just be estimates, and they usually don’t account for employee benefits. A good health insurance plan can give you a lot more disposable income; a bad plan or no plan can do the opposite. Another source to consult is the Bureau of Labor Statistics’ Occupational Outlook Handbook. It provides information on the highest paying, fastest growing and most in demand jobs; the career outlook for various fields; the median pay; what the highest 10% and the lowest 10% earned for almost any job; and more. The government offers a vast data set, but it reflects the United States as a whole and isn’t broken down by city or years of experience, so again, it will just give you ballpark figures. You could also assume that you’re likely to end up in one of the top 20 most popular jobs for college graduates and see what they earn, as reported by Forbes. It can be sobering to learn that you might end up as an administrative assistant earning $40,000, a customer service rep earning $35,000, an intern earning $30,000 or a substitute teacher earning $25,000. How would you repay your loans on one of those salaries? Is it time to think about majoring in software engineering? Use a spreadsheet like the one below to estimate your expenses, modifying it as necessary to meet your own needs and making copies for each city you’re considering living in. This task might seem overwhelming if you’ve never researched how much real life costs before. Few of your peers have probably undertaken this task. Your parents might not even do it to manage their own finances. But you’ll be so much better off financially if you learn to do this task now. Doing this time-consuming, eye-opening work is key to understanding what you’re really getting into when you borrow money for college. At a minimum, fill out the first column. If you don’t have older friends or relatives who live in your desired areas, an online forum like Facebook or Reddit might get you some on-the-ground answers. Good sources for living expenses include Trulia for median rental prices by neighborhood and Numbeo, the world’s largest user-contributed database about costs in cities and countries worldwide. You can also use a cost-of-living calculator to see how far a comparable salary will go in various cities or to directly compare living costs in two cities. Now that you’re armed with numbers based on real information, not just guesses, you can make an informed decision about how much you’re willing to spend on your education and how much you’re willing to borrow. Be aware that some expensive colleges have huge budgets for scholarships, including some full scholarships. If you have an excellent academic record, it isn't dumb to apply to one of those dream schools in case you are awarded one. But sometimes, the hard truth is that it makes more sense to attend your state school and graduate with little to no debt than it does to attend the Ivy you’ve worked hard your whole life to get accepted to, but that hasn’t offered you enough financial aid. Next, let’s talk about how federal student loans work. Find out whether going to grad school and the payback you get from it – earnings, lifestyle, career opportunities – is worth the high cost of tuition. College is expensive but has many benefits. Use these tips to avoid borrowing a fortune for college. College Education Cliches: Fact Or Fiction? Here is a look at some common myths that might help you decide when and if you should continue your education. When Is College The Wrong Investment? Attending a very expensive college with the wrong degree could turn into a bad investment due to low salaries and high debt. Is An American College Education Still Worth It? It’s crucial for parents and students to explore all funding options when planning for college. How You Will Pay for Your Child's College? Here are some tips for surviving college tuition costs for your kids. The rising cost of higher education and high unemployment rate following the Great Recession has caused many young people to question the value of college. Summer is an ideal time for high school seniors and their parents to take a sanity check and make sure the chosen collegiate path fits their finances, too.